(MoneyWatch) For all those who have been using Microsoft (MSFT) Windows 8 on a desktop and found switching between a Windows 7-like interface and the tiled one that is similar to Windows Phone, there's good news and bad news, according to blogger Paul Thurrott. The good news? Microsoft appears to be moving to a single interface for the desktop. The bad news? You'll be using the so-called Metro tiled interface. Yes, the one that so many people complain about. Microsoft is proving itself determined to run its core business into a brick wall. Windows 8 has represented Microsoft's attempt to achieve some popular success in the world of mobile and tablets, fending off Apple (AAPL) and Google (GOOG), while creating a bridge from its traditional strength in desktops and laptops. With this latest move, Microsoft has, indeed, stepped into something, and it's not a winning strategy. I've been traveling extensively and talking to technology users and IT executives. I've heard next to nothing positive about Windows 8. That seems largely because of the mixed user interface metaphor. The tiled portion is optimized for a touchscreen, something that you can't easily retrofit onto a desktop or laptop that wasn't designed with one, which means having to change all your hardware if you want to move to the new operating system. The traditional interface portion at least gave people teh ability to work in a way they were accustomed to and ignore the whole touch issue if they wanted. Only, Microsoft apparently heard half the message from customers -- get rid of a dual interface, which may be fine with a tablet/notebook convertible, but not for much else -- and ignored the part demanding a desktop that people could use more easily with keyboards and mice. This is like Facebook (FB) making unpopular changes to its user interface, only with a key difference. Most people don't have to use Windows 8 anymore and are becoming more open to exploring alternative. Control of the desktop has been the source of Microsoft's strength because it also enabled the company to build the Office franchise. To embrace only Metro going forward is an amazingly foolish and pigheaded strategy. Sure, sometimes companies need to change products and make room for the new, but to do so in a way that could seriously damage the company's prospects is bewildering. 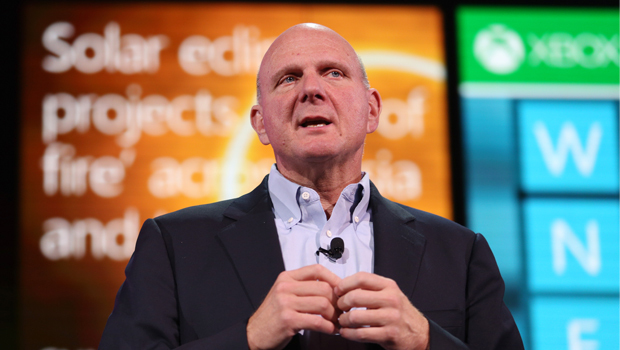 Has Steve Ballmer been loading up on Apple and Google stock recently?